The New Testament describes the good news of Jesus Christ, the Gospel that a dying Savior Who rises from death in order to give new life to all who dare to follow Him as a skandalon. The term refers literally, to a bear trap, a snag that will prevent some from following Christ, the One Who calls us to submit to Him and part with our old dependencies on the conventions of a dying world. Part of the trap consists of the Christian's celebration of good news won in such an ugly way, via execution of God-in-the-flesh on a cross. Ugly too, is the Gospel's call for us to accept that our sins are what killed Jesus Christ and to accept the need for our old sinful selves to be crucified through repentance so that the new people God wants to help us become may rise with Christ. Christ calls us to accept that the beauty of Easter morning only comes through the ugliness of Good Friday. ...Christianity is not a religion simply formed around a wise teacher. Love your enemies. Turn the other cheek. Lose your life to find it. None of these provide the catalyst to launch a world-changing faith. Take up your cross daily - who wants to rally around that? And perhaps more revealingly, Peter, following Pentecost doesn't stand up and declare "I preach this Jesus, who spoke the Beatitudes!" No, over and over again through the book of Acts, Peter proclaims, "this Jesus, whom you put to death, and who God raised from the dead." The resurrection is the single most significant factor of the Christian faith. It's the reason we come together this weekend, with millions of believers around the world everywhere, to celebrate our "ugly" salvation. Because it is "the Good News that saves you if you firmly believe it...that Christ died for our sins, just as the Scriptures said. He was buried, and he was raised from the dead on the third day" (1 Corinthians 15:2-4). Death isn't the last word anymore. Death has become life. Ugliness becomes beautiful. He is risen. He is risen indeed. ''If more people forgave, maybe there'd be less violence in the streets." So said one seventeen year old from the Boston area, reacting to a five year old girl, paralyzed by gunshots who, along with her mother, has forgiven the gunman. Read about it here. (Thanks to Glenn Reynolds for linking to this piece.) For background information, look here. with the two conversational partners, you'll enjoy Charlie Lehardy's An Easter Dialogue. Charlie remains one of the most thoughtful and thought-provoking writers on the web. Don't You Think the Queen Could Afford a Slightly Larger Gesture of Goodwill? See here. It reminds me of the old Judean custom of giving Alms on the brink of Passover, discussed here. The incomparable Mark D. Roberts is doing a series of short posts on the last words of Jesus from the cross. Mark's reflections are definitely worth examining. What Do Mahatma Gandhi, Napoleon Bonaparte, Albert Einstein, and C.S. Lewis Have in Common? Among other things, they all had interesting insights on Jesus Christ. Check out what they all had to say here. Yes, I was there and so were you. We were there, but not as innocent bystanders. We were there because Jesus was crucified for us. If we had no sin, there would be no need for Jesus to die. But there is sin in our lives. Yet because of our sin, God looked at us with mercy. Out of mercy and love God gave his only Son. Jesus was crucified for us. Jesus paid the debt that we could not pay. Yes - and when we think about it, it causes us to tremble. Every one of our sins nailed Jesus to the cross. Every bad thought we have ever had nailed Jesus to the cross. Every bad word we have ever said nailed Jesus to the cross. Every bad action we have ever taken nailed Jesus to the cross. Every good thought we have failed to have nailed Jesus to the cross. Every good word we have failed to say nailed Jesus to the cross. Every good action that we have failed to take nailed Jesus to the cross. Jesus bore this entire weight on his shoulders. Jesus was pierced by our every inappropriate thought. Jesus was pierced by our every harsh word. Jesus was pierced by our every unkind action. His blood flowed to wash us clean. His blood flowed to set us free. For a while darkness had overtaken the world. Too often we let the darkness over take our lives. Too often we let the darkness extinguish our hope. Too often we let the darkness rule. But the sun did shine again. At the cross the Son of God has overcome the darkness. At the cross we have seen the light. At the cross the burdens of our hearts are rolled away. We will also be there at the empty tomb Easter morning. We will be there as the light shines bright. We will be there to celebrate our new life. We will be there to celebrate our freedom. We will no longer tremble. Instead we will bend our knee in adoration. And with our tongues confess that Jesus Christ is Lord. Nagaland has one of the largest concentrations of Christians in India...the occasion [for our visit] was the one-hundredth anniversary of the coming of missionaries to that area. Tens of thousands came to the celebration--some walking for days over rough jungle trails. One hundred thousand people, we were told, would be gathering each morning for a Bible study, in addition to the evening evangelistic meetings. When we arrived at Government House, where we were to stay, a man unloaded our baggage from the car, then took our shoes to wipe mud off them. I protested, saying we could do that, but he insisted. Only later did I discover that he would be leading the Bible study for those one hundred thousand people the next morning! During this Lenten season, we have focused on Jesus’ call to be servants of God and of our neighbors. 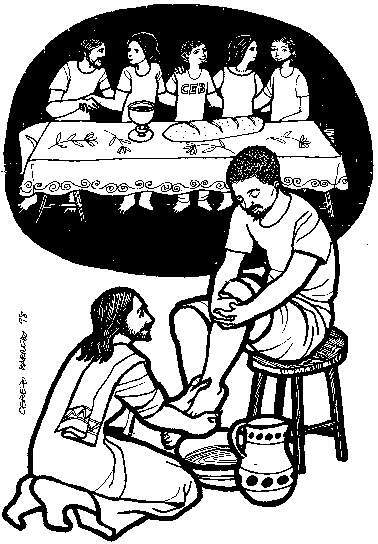 The logo for these 40-Days to Servanthood is inspired by this incident from that Maundy Thursday when Jesus gave His disciples a command to love others as He had loved them and then showed them that true love and true greatness is about the willingness to serve. I would like to be a servant. I know that’s Jesus’ way. I know that a life of service to God and to others is the appropriate response of a person saved from sin and death by Jesus Christ. I know that I have a place in God’s kingdom because of what Jesus did for me on the cross and because I believe in Jesus. I know that love so great given so freely deserves my surrender. But it’s hard to surrender. As I’ve shared with you before, I identify with George Bailey in the movie It’s a Wonderful Life when he tells his future wife, Mary, “I want to do what I want to do.” In my sinful heart, I’d rather be served than be a servant. By contrast, on the first Maundy Thursday, on the brink of His suffering and death, with every reason in the world to be turned in on Himself and filled with self-pity, Jesus served His disciples, faced His cross, drew strength from the Father, and commanded each of us to love just like He loves. How do we do that? How can we be servants when everything inside of us and all the warped values of a selfish world fight against it? Second: We rely completely on Jesus Christ. A young man in the Boston area is recovering from alcoholism. I’m honored that he reads my web log regularly. About a month ago, he wrote to me to say that he sensed a call to a particular area of service, helping others to recover from their addictions. He said that he sensed this even though he had never been religious and wasn’t even certain what he believed about God. Two weeks ago, he attended worship at an Episcopal church and wrote to tell me afterwards, “I think I’m beginning to get it, Mark.” Just this past week, he made a presentation to some addicts taking their first tentative steps down the path to recovery. He wrote that he was frightened and yet at peace about it. He also said that he was relying on his Higher Power, who I am confident is the Lord Jesus Christ, in Whose strong hands I have also been placing him in my prayers. On that night when He was betrayed, sitting with His disciples, Jesus could have simply told them to love. But Jesus wasn’t one of those, “Do as I say, not do as I do” preachers. He lived the love He commanded. He also left that room to face kangaroo justice, violent beating, hateful rejection, and a painful death on a cross. Jesus’ love was more than mere words. He dared to live it. He served. He served each one of us and every member of the human race. And He calls us to love and serve others in the same way, a fitting response to His love and service, a powerful way to demonstrate what happens when imperfect people like you and me rely on the perfect Christ and let His goodness and power work in us and through us. UPDATE: Thanks to Mark Olson of BlogWatch for mentioning this message on his site! Santos Wins: The Explanation...and What's Next? When, on this past Sunday's West Wing, Democratic presidential nominee Matt Santos (played by Jimmy Smits) defeated the GOP standard bearer, Arnold Vinick, my reaction was similar to that of blogger Rick Moore: I thought that the Democratic producers and writers of this excellent, but canceled, series couldn't resist putting another Democrat into the Oval Office. ...after Mr. Spencer died, [Lawrence O'Donnell, West Wing executive producer] said in a recent interview, he and his colleagues began to confront a creative dilemma: would viewers be saddened to see Mr. Smits's character lose both his running mate and the election? The writers decided that such an outcome would prove too lopsided, in terms of taxing viewers' emotions, so a script with the new, bittersweet ending — including the election-night death of Mr. Spencer's character — was undertaken by John Wells, executive producer of "The West Wing" and "E.R." Strands of the previous plot line seemed apparent in last Sunday's episode, however. With about ten minutes to go in the show, we were told that two states were to be heard from: Oregon and Nevada. To get to the required 270 electoral votes for victory, Vinick (played by Alan Alda) needed to carry just one of the states, while Santos needed both of them. I told my wife, "Vinick wins." "Why?" she wondered. "Oregon might go for Santos. But there's no way Nevada votes for him," I explained. Nevada goes Republican in presidential elections and even the retirees, who might swing a vote to the Dems in other states, would go for a guy like Vinick; he appeals to the libertarian sensibilities of Nevada's brand of retirees. Anyway, here's my prediction for what happens next on West Wing: Santos asks Vinick to serve as his Veep. They could simply ask the Electoral College voters to do that. We've never had a coalition executive branch before. It's too bad that the producers and writers won't be able to explore what that might be like. By the way, I really love this show and am sorry to see its demise. There are five episodes to go. On Sunday, I hope to link to all the weekend messages given as part of our congregaion's 40-Days to Servanthood emphasis, designed to be a launching pad to lifestyles of service in Christ's Name. UPDATE: Thanks to Bruce Armstrong of Ordinary Everyday Christian for linking to every installment of this series and for his words of encouragement! There is an inextricable link between worship and servanthood. This is why worship gatherings are often called “services.” In them, God teaches us how to love Him and to love others, to live with a focus upward to Him and outward to our neighbor. But unless our weekend services of praise are matched by service to our neighbors in Jesus’ Name, our worshiping is nothing more than lip service. If our love for God is authentic, it will be seen in active service to others. Of course, we won’t always express this authentic love for God and neighbor. Christians, like other human beings, are infected with the disease of sin. But God is willing to help us when we fail. “If we confess our sins, he who is faithful and just will forgive us our sins and cleanse us from all unrighteousness” (First John 1:9). All who believe in Jesus Christ are to live, as Martin Luther reminds us, in “daily repentance and renewal,” seeking God’s help as we strive each day to love Him and to love others. Bruce Armstrong has an interesting post remembering the Bataan Death March of World War Two. One of my high school teachers was a veteran of the march. In the light of this recent poll showing that most Americans don't believe in a resurrection of the dead, one might wonder about any proof Christians might have that our Easter celebrations are warranted. This message, shared last year on Easter Sunday, might help you prove the good news of Easter for yourself. This Sunday, as we celebrate the resurrection of Jesus at Friendship Church, the congregation I serve as pastor, we’ll consecrate ourselves to Christian servanthood. If we remember that each of us has our own indispensable roles to play in God’s plan, we’ll serve with enthusiasm, energy, and fulfillment our whole lives. After an evening Lenten service, which included discussion, a friend approached me. “Mark,” he said. “I should have mentioned that one of the best things we can do is get out of our comfort zones and try things we think we can’t do or that we’re not interested in doing.” He went on to explain that in his experience, serving outside his comfort zone caused him to see how faithful God is in helping His servants. He also found God-given talents he didn’t know about. By the Way: What is a Gospel? With the recent hubbub about 'The Gospel of Judas,' it seems like a good time to answer the question: What is a gospel anyway? What do we mean when we call a piece of ancient literature a Gospel? To answer that, we have to understand the meaning of the word, gospel itself. It's an elision of the Old English term, good spell or God spell (Our English word, good, derives from God. The phrase Good Bye began as a way of telling people God Bless Ye.) Spell was a word for news. Gospel, then, is good news, specifically the good news about God's free gifts of forgiveness and everlasting life granted to all with faith in Jesus Christ. What made the Jewish faith in the Old Testament unique among the religions of the world was that a relationship with the Almighty or enjoying blessedness was said to have nothing to do with religious works. In Biblical faith, one might do good works, but they always come in response to God's favor, freely granted, not as a ploy to earn God's favor. In Jesus Christ, God extended the possibility of rightness with God to Gentiles as well as to Jews. As was true for the Jews, so for non-Jews: Reconciliation with God is not attainable by doing certain religious deeds or obeying religious laws. None of us is capable of sufficient goodness to measure up to God's standards of moral perfection, anyway. But now, irrespective of law, the righteousness of God has been disclosed, and is attested by the law and the prophets, the righteousness of God through faith in Jesus Christ for all who believe. For there is no distinction, since all have sinned and fall short of the glory of God; they are now justified by his grace as a gift, through the redemption that is in Christ Jesus, whom God put forward as a sacrifice of atonement by his blood, effective through faith. He did this to show his righteousness, because in his divine forbearance he had passed over the sins previously committed; it was to prove at the present time that he himself is righteous and that he justifies the one who has faith in Jesus. So, could the Gospel of Judas be considered a gospel? Not really. That document was rooted in the Gnostic notion that some deeper relationship with God was acquired through intellectual attainment--in this case, just another religious hoop or good work--rather than by the amazing grace of God. (1) Burnout can be the result of wrong motives. When our giving--whether it’s of our money or ourselves in service to others--is rendered “reluctantly or under compulsion,” it will burn us out. There's nothing more wearing or destructive to our spirits than "have to" religion. Ben Witherington, one of my favorite New Testament scholars, has posted two helpful pieces on the 'Gospel of Judas.' See here and here. ...we do not have a Greek text of this Gospel, we have a Coptic one from which the English translation has been made. To simply state this text was based on Greek text is to argue without hard evidence. The fact that Irenaeus mentions this document may suggest there was a Greek original, but we do not have it, and the translation done is not based on any Greek text. I confess that I had taken on face value the claims of the National Geographic's team that the Coptic text they've released was a translation of an earlier Greek document. There have long been rumors of a Greek-language 'Gospel of Judas.' So, I simply leapt to the conclusion that the current document translates that one. This may not be true. There may have been no Greek-language document. The potential importance of there being no original Greek-language text is this: Greek was the international community's second-language in Biblical times. It was the lingua franca, much as English is today: the language of commerce, of philosophy and the arts. This is why all the canonical works of the New Testament were written in Greek. We know that gnositicism was a perversion of the good news about Jesus Christ already being proclaimed immediately following His death and resurrection. The non-existence of a Greek document could indicate the lateness with which the Gospel of Judas was composed, thus undermining its credibility. But even that, to me, isn't as significant as Witherington seems to think that it is. As I indicated in my post on this subject on April 6, the theology of this gnostic gospel is so counter to the faith traditions of Judaism, to the agreed-upon utterances of Jesus, and the other writings of the New Testament, that it's clear that the Gospel of James was never in the running for inclusion in the Bible, it ever it was considered. That's because it doesn't comport with what history, faith, and experience have taught about Jesus Christ or Judas. ANOTHER UPDATE: Thanks also to Alex Jordan and the rest of The Best of the God Blogs crew for linking to my original post on the Judas document. Alex's blog can be found here. (I met Alex last October at the first-ever GodBlogCon in the Los Angeles area. He is a thoughtful, articulate man, both in person and in his writing. The Best of the God Blogs site has been very kind to this blog and I'm thankful! AND ANOTHER: Thanks to Wounded Healer for linking to my original post on the Gospel of Judas. MORE THANKS: This time to Brian Bill for linking to my original post on 'The Gospel of Judas,' listing it along with several other pieces dealing with the document. Thanks, Brian! ANOTHER THANKFUL UPDATE: Thanks to Ron Jones of Three Things for linking to my original post on the Gospel of Judas! The Choice: Jesus or the Crowds? Father Andrew Greeley tells the story of a sixth grade social studies teacher who decided to have her students go through an election process, the object being to teach the kids about democracy. The students, it turned out, were enthusiastic and got into it. Even though the their parents had fostered a highly competitive atmosphere, especially as it related to academics, the kids got past the jealousies and resentments that can go with such circumstances, and elected a young woman who happened to be the smartest one in their class as the president of their mock country. Everything went well for the whole school year. But the next year, things changed. By then, the parental pressure for good grades was so intense that the kids began to turn on their former president. They resented her superior academic performance and the respect she'd garnered from them. They began to spread untrue stories about how she studied all the time, pinning the nickname of ‘The Computer’ on her. The message they were sending her was clear: Dumb down and be the way we want you to be! This is a story that gets played out in many different ways in our world. And not just among young people. The crowd may love us as long as we’re doing what they want us to do, as long as their egos are boosted, as long as we do their bidding. But if something we say or do displeases them, they’ll point their thumbs down at us quicker than Roger Ebert or Simon Cowell. This, folks, is the real story of Palm Sunday. Jesus is welcomed into Jerusalem. Everybody’s happy. Yet amid the Palm Sunday celebrating was an atmosphere of implied violence, of threatened rejection. The actions and the words with which the crowds welcomed Jesus were fraught with ambiguity. These crowds, itching for war and conquest, must have scratched their heads at what Jesus did that evening. He simply stepped into the Temple, looked around, and went back to Bethany for the night. They must have been further mystified by what he did the next day. He didn’t confront the Romans, demanding their surrender or removal from Jerusalem and the surrounding Judean territory. Instead, he went to the Temple where, appalled by how the place was being misused--not as a place of prayer and worship, but as a place for price gouging and injustice--he threw the extortionists out of the place. Rather than confronting their foreign enemies, Jesus turned to His fellow Judeans and said that there was something rotten in their religion, their spirituality, their souls. On Palm Sunday, the crowds welcomed Jesus because they thought He had come to do will. What they came to realize in the days after that is that He had really come to do theirthe Father’s will. He really had come, as He had already said, “to serve, not to be served and to give His life as a ransom for many.” He hadn’t come to confirm them in their sense of moral superiority, but to confront them with their need of a Savior and to be that Savior! And so, like the students at that school in Greeley's story, disappointed and shown up by the girl they had voted for the year before, the Jerusalem crowds turned on Jesus. On Thursday night, just four days after His triumphant entry, Jesus was arrested and the next day, the same crowds cried for His blood. They cried too that the Roman governor release a murderous thug, Jesus bar Abbas be set free. (This man was otherwise known as Barabbas; whose name in English is Jesus, son of God.) Barabbas was a terrorist. The crowds may have thought he had the stomach Jesus of Nazareth didn’t have for revolution. The people were desperate for a leader who would follow them. They were sure now that Jesus, the son of Joseph wouldn't do it. Maybe Barabbas would. Now here’s the question that Palm Sunday forces all churches and all Christians to confront: Will we be like the crowds or will we learn to be disciples, true followers of Jesus? I know that too often in my own life, I’ve followed the crowd or followed the world's way of doing things, instead of following Jesus. (After all that's the easy way to go!) But how exactly do we make the choice of discipleship over crowd-following? The Palm Sunday crowds probably thought that their lives would be so much better if the Romans were toppled and sent home. Then, they could love and serve their neighbors. If a thousand other things were just so, then we could be really good followers of Christ. But Jesus calls us to follow now on our current schedules, with our current incomes, under our current circumstances, just as He loves us now. On the Sunday after Easter, April 23, you and I are going to have the opportunity to get a handle on the area of God-given passion that burns in each of our souls, the way in which we can most effectively serve in God’s kingdom. That Sunday after Easter is notorious for poor attendance in churches the world over. The crowds, seeming to conclude that by going to Easter worship, they've filled some religious obligation, like to worship at St. Mattress of the Springs on the weekend after Easter. But I hope and pray that you and I will choose discipleship, the path of servanthood in Jesus’ Name and that April 23 will be the launching pad for a whole new phase in the life of Friendship! The great nineteenth century evangelist Dwight Moody’s life was changed when he heard a preacher say words like these: “The world has yet to see what God might do in the life of someone wholly devoted to Him.” Moody prayerfully asked God that night to let him be that person. May that be our prayer, choosing to follow Christ instead of the crowd. I live for the day when people everywhere say, “Friendship Church...that’s the congregation with all those servants!” Won’t that be cool? Jesus once asked rhetorically: “Is there anyone here who, planning to build a new house, doesn't first sit down and figure the cost so you'll know if you can complete it?” (Luke 14:28, The Message) This coming Sunday, as we celebrate the resurrection of our Lord Jesus at Friendship Lutheran Church, we’ll be asking people to commit--or consecrate--themselves to servanthood. I'll be inviting those of you who read this blog to do the same thing.